With human flights beyond Earth orbit not expected to occur for at least eight years, the private sector is increasingly eying deep space for a series of ambitious robotic and human missions for both adventure and profit. Nine programs are currently underway that include robotic and human landings of the moon, human flybys of the moon and Mars, the mining of the moon and asteroids, and even a settlement on Mars. Backers of these initiatives include the X Prize Foundation, Google and its executives, and the world’s first space tourist, Dennis Tito. The table below show the deep space initiatives now being pursued by the private sector. All but one of these projects aim to produce concrete results no later than 2020, which is the year before NASA is set to send astronauts beyond Earth orbit on its new Orion spacecraft and SLS booster. Most of these projects are American initiatives with some foreign participation. The space tourism trip around the moon partners the U.S.-based Space Adventures with Russia’s Energia and makes use of modified Soyuz hardware. 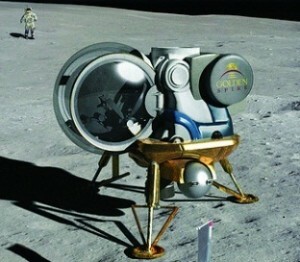 The Google Lunar X Prize includes 23 teams around the world, eight of which are based in the United States. The Soyuz trip around the moon involves one pilot and two customers paying $150 million each. To date, Space Adventures has announced that it had one client committed and was searching for a second one. Six of the ventures are purely commercial in nature. The Google Lunar X Prize is funded by a for-profit company but run by the non-profit X Prize Foundation. Many of the competitors are commercial entities. The Inspiration Mars Foundation, which aims to send humans on a trip to the Red Planet, is also a non-profit group. Of the three companies focused on extraterrestrial mining, Planetary Resources has the deepest pockets. Google Co-founder Larry Page and Chairman Eric Schmidt are both multi-billionaires while K. Ram Shriram and Ross Perot, Jr. is worth an estimated $1.6 billion and $1.4 billion, respectively. Charles Simonyi and James Cameron are millionaires. Mars One is a European-led initiative that would put a small colony on the Red Planet in 2023. It is relying on being able to sell the broadcast rights to the project to cover the $6 billion cost. Updated on March 9 to include Mars One. Added Mars One to the list. Thanks Gary.